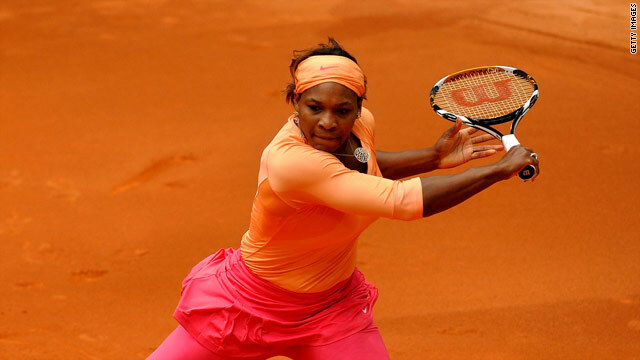 Serena slumped to a three-set defeat on the clay at the Caja Magica in Madrid. (CNN) -- Top seed Serena Williams slumped to a third round defeat to Nadia Petrova in the Madrid but her sister Venus will move to number two in the world rankings after an earlier victory over Francesca Schiavone. Venus, the fourth seed at the clay court tournament, was broken early and lost the opener to the 15th-seeded Italian, but recovered to win the next two sets easily for a 3-6 6-1 6-2 win. The victory will mean the 29-year-old will occupy second spot behind Serena when the new list is released next week. The Williams sisters have occupied the top two in the rankings for 45 weeks previously, but the last time was over seven years ago. But Venus' victory was overshadowed by a disappointing defeat for her younger sister in a match played in chilly conditions in the Spanish capital. Serena had made hard work of beating another Russian, Vera Dushevina, in a three-set opener on Monday, but appeared in command against world number 18 Petrova as she won the first set. Petrova needed lengthy treatment after the opener and Williams looked set for a comfortable win, but a series of lapses allowed her opponent to level at a set all. Williams was broken early in the decider and looked decidedly out of sorts, her discomfort increased by a amateurish and half-hearted attempt at an overhead winner as she fell 3-0 down. The Australian Open champion finally rallied to put pressure on the erratic Petrova, but it was too late and a love service game saw the 16th seed home, 4-6 6-2 6-3. Petrova will now meet Czech Lucie Safarova or Romanian Alexandra Dulgheru in the quarterfinals while Serena has had her preparations for the French Open later this month cut short.